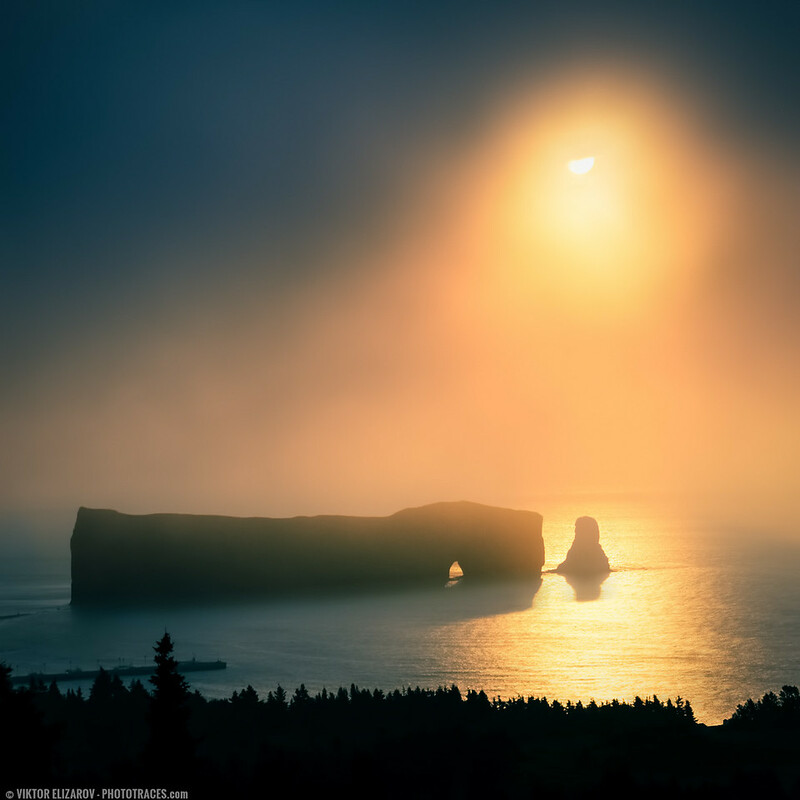 That year I spend 3 days in the vicinity of the town of Percé on the Atlantic coast of Quebec. The weather was awful for all 3 days; with humid, hazy air and dull sky without any clouds. I was ready to write it off as a complete photo disaster and hoping to have more luck at my next destination – the Prince Edward Island. On the morning of my departure, I woke up at 5am ready to take 8 hours drive to Prince Edward Island and this is the view I saw. I had just enough time to drive to the hill and take few pictures before morning fog was burnt off my rising sun. I did not have time for setting up my gear, so I was shooting hand-held. Even though the light was not dynamic at all I took 3 bracketed shots (-1, 0, +1) just in case. I selected only 2 bracketed shots (-1 and 0) in Lightroom and processed them individually. Below is the result of Lightroom processing. In the final step I placed 2 images on separate layers in Photoshop and blend them together using luminosity masks. (for more details check my Review: “The Art of Digital Blending”). From darker image I used only highlighted area of the sun. Lightroom: import, tagging, contrast, color correction and splitonning. I produced 2 separate images and exported them to Photoshop. Photoshop: I opened 2 bracketed photos directly in Photoshop and placed each image on separate layer. Then, I used luminosity masking techniques to blend them together. I also cropped the image to improve composition. Topaz DeNoise was used to reduce digital noise everywhere. What is Lightroom and What is it Used For? wo! This is beautiful scene and you did enjoy the view and your money spend.